What is your experience with doing trail maintenance and volunteering? In the past year, I've emailed several organizations offering to help with trail maintenance but never received a response. These were for scheduled dates and places and were being offered for beginners to learn trail maintenance. This confuses me. My only experience with doing maintenance is when I hike I will stop and move limbs and trees off the trail if I can drag them out of the way. I've been thinking about becoming an official volunteer after next year. Last year Overload and I worked a weekend with the Mass. AT club. We stayed at Upper Goose pond Cabin and tent sites. It was a wonderfully fulfilling experience. I sent a message to Cosmo, thru the Blaze....he e-mailed me a work schedule and we showed up. We will work again somewhere this year. I remove what dead down wood I can from the trail. If it rains, I may create water breaks if there are extra rocks handy. Otherwise I walk on the down hill side of the trail. If everyone did that, there would be more drainage and fewer puddles. Speaking of drainage, what moron creates a trail by scraping away the top soil and vegetation? I think I saw that in NC or GA. I forget. It may have been in the bear sanctuary. It was very neatly cut, and obviously not natural, nor the result of many footprints. Would not it be better to improve the trail by raising the walking surface so water drains off? Volunteering for official maintenance can wait until I have seen all of the AT. If you can't find your local crew, contact Laurie P at the ATC or via PM at TOS. She is very helpful at getting names and e-mails for folks if you get bogged down. Little tough for me from Chicago but if I lived close getting to know your local guy/gal would be what I would do. There are probably lots of odds and ends you could help out with. Is there a ridgerunner in your area? Do you live in southern VA? We just had our annual picnic for trail maintainers and volunteers this past Sunday. It was only for those members who had logged any hours doing anything. It could be as little as 1 hour on a clip and walk. It's an added incentive to get more members to volunteer. Still we have some members who never log a single hour and that's okay too and we have an annual picnic around Christmas for all members thanking them for their monetary support. You don't have to run a mower or chainsaw to help out you can help in other ways like shuttling (that's where Shellie gets her hours) or volunteering at the Nature Center. We hold our monthly meetings at the Nature Center in the County Park and volunteers man the info desk once a month on a Saturday and answer questions, and for this the County Park gives us the center once a month no charge. The State office keeps track of our hours and the distribution of funds is based on how active a Chapter you have, so we do quite well with mid week and weekend maintenance days. I pay my dues to several trail clubs, trash out and move brush and clear waterbars whenever I go hiking, rebuild cairns if they're in need of it. I haven't done real trail maintenance in too long. Maybe this summer I'll volunteer to pack supplies in to the guys working on the new section of the NY Long Path. I'm in no shape to be levering up rocks, or wielding a peavey or pulaski, but I can surely shoulder a pack and walk up to the ridge with a couple of dozen pounds of stuff for the guys who are. Learn from the best. Get in touch with Bob Peeples at Kincora. Tomorrow Kathy and I will be going to "our" section of AT land to do our spring Boundary Monitoring trip. I'm looking forward to a day in the woods. We work the area from a little south of Graymoor to a little north of it. We only use the trail to get from one parcel to another. The rest of the time we're bushwacking around the edges of the land. It's a small area, but it's nice to get to see areas that most hikers don't. Usually we just have to cut back brush so we can find the surveyors monuments and markings but one time we did find a hunter's tree stand right near the trail, and last fall there was a shed that had blown down the hill from Graymoor's shrine to Mary. I'm hoping for an uneventful trip with no surprises; I need the mental relaxation a walk in the woods can bring. whats the purpose of this? to make sure that the surveyors markings are still there? looking for someone encroaching on a.t. land? who do you contact if you find something amiss? We've found a few different kinds of problems, dumping of yard waste and garbage, hunter's tree stand, a "neighbor" who cut down trees on AT land, and a shed that rolled down a hill onto AT land. I'll talk to neighbors in the area of a problem, without accusing anyone and report all problems to my supervisor, another volunteer, member of the NY/NJ Trail Conference. 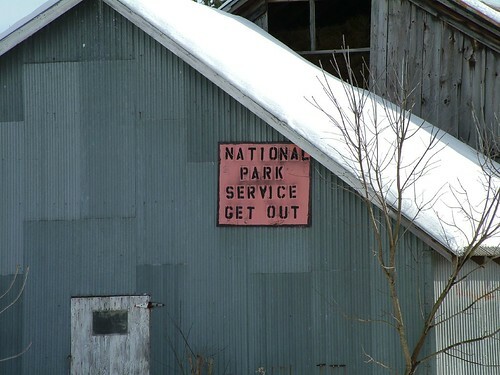 Anything of a serious nature, or a matter of life and death gets reported to the NPS ranger in charge of the AT. is this map and compass work or do the various markers have a gps identifier? It varies. In a lot of cases, it's like posting private land. There are markers that are visible one from another, or even survey blazes on the trees. You can also often follow the posters of an adjacent landowner. I know that there are a number of (non-AT) corridors in NY where the yellow survey blazes are easier to follow than the trail they're protecting. Oftentimes, the maintaining organization will have georeferenced boundaries for the parcels. That's surely the case in CT/MA, where all lands protected as wilderness, recreational land, historic preservation, and so on are in public databases. kbk.is-a-geek.net/catskills/te…la=41.792&lo=-73.410?z=13 shows a typical strip of trail, with these areas marked out. The ones tagged, 'Appalachian National Scenic Trail' are the ones owned by the US Government, and the ones tagged, 'Appalachian Trail Conference' are ones that are ATC-owned. These typically depend on trail volunteers to 'beat the bounds', repost boundary markers that are lost or damaged, and report problems where local landowners are encroaching on the corridor. Individual volunteers typically report problems to the clubs, which have people that liaison with the NPS and ATC. Local landowners, many of whom had the trail corridor condemned by eminent domain, frequently deeply resent the presence of the trail. It's not unheard of for a maintainer to find all the survey monuments and boundary markers destroyed on a stretch of boundary by a resentful landowner. On the New York Long Path, there have even been reports of shots being fired at hikers who missed a posted trail relocation and strayed into an easement that the landowner had wtthdrawn. When we started it was with the surveyors map in one hand and a compass in the other and a 300 foot tape measure in a third ( there's 2 of us, remember?). Since then we've collected the GPS co-ordinates for each surveyors monument. But truth be told, we don't need a compass or GPS to find them anymore. We've walked the lines enough to know where each monument is. Now we steer by looking for monuments near particular bushes, trees, piles of rocks, and other visible clues. Built stairs, a cribwall and treadway. By Halloween, maybe sooner, you will no longer have to climb that nasty gully nobo out of Beachy Bottom. This is a great bunch of folks.....besides the 2 girls,spouses who came for Sunday, I am the youngest on the Crew. I'll have my own official t-shirt next time out. they have authorized my hard hat to look like the fish car window! Coach Lou, thanks for volunteering. Looks like you have the stairs done in time if I make it that far next summer. blow the picture up to full screen...looks like a georgia DOT road crew...1 guy does all the work and 7 others stand around and watch. Max, I'm all dirty 'cause I did a 10 foot section of the cribwall. I dug the hole for the retaining boulders and the green shirts moved the boulders, 100 feet from the rock garden on a high line (which was way-cool). The dirt came from grubbing stones out of the holes to reuse for the treadway. Everyone worked, and worked hard. This is a really good bunch of folks. They are teaching me all the building methods. I am a short bull, I don't mind a good day of hard labor. The stairs are done, we just have to finish off the retainers and the approach to them. I forgot my camera, but in 2 weeks that part will be done. Then we just have to finish clearing the path. The last thing will be painting the blazes, and blocking off the old path. The one thing that is a bummer is these work weekends cut down on my mileage. But let me tell you that the next morning my ankles feel like I did 15+ mile days. We are on hills naturally, and we haul all the tools in and then haul them out. You are dirty because you are the youngest of the group and we all know how kids like to play in the mud. Nasty gully? I remember a steep and icy bit at the top where Moose slipped (recovered on her poles, no real harm done), and some sucking swamp down by the bike path, but otherwise, no nasty gullly, just a typical fall-line trail. It went up alongside the stream, then up steeply from it, crossed the stream's headwall and finally made it up onto the ridge. Maybe it's nastier when it isn't covered with snow. I do remember some nasty stuff on the north side of West Mountain going down toward the Doodletown bridle path, but I thought that part was already taken care of. Oh, I know where that is! CoachLou, thanks for posting the video, I really enjoyed it. This is great stuff you guys are doing. However, I must say that almost none of our trails are as smooth as the ones you are fixing. Not saying your work is not needed. Just saying I would be very happy to walk on the trails you have not fixed yet. They looked kinda' flat too. Is that a camera trick? The post was edited 1 time, last by BirdBrain ( Aug 25th 2014, 8:13am ). I have been told, and I have observed that these things are put in because of the volume and type of folks that use the trail. Soooooo many people are in the parks in NY, folks like us and folks that watched those TV shows about the wilderness. Trail has to be durable, erosion wise and rescues are so frequent that a smooth trail is also needed for that reason. The 'crib walling' is made primarily to channel water to slow the erosion. They go in water flow areas. I get it. I know it is a good thing for the trail and those that use it. I really appreciate what you guys are doing. I am just teasing about the trails down there. Many driveways up here are in worse condition and harder to navigate than those trails. I can't wait for my leisurely walks down south. I might even be tempted to carry cheesecake. I really appreciate what the trail crews do. I find it amazing what volunteers have done on NYs Bear Mountain. Have you folks seen the project on the AT going up Bear Mountain from the Bear Mountain Inn? Makes going up, and coming down, like talking a walk in a park. Not what I prefer, but with so many people walking there I guess it was a necessity. Thank you volunteers one and all! as much as i recognize stairs help curb erosion, i hate stairs. now we know why you skipped the approach trail. btw, i also hate stairs. You guys hate stairs? Try dancing up a long spiral staircase... or are you a-Fred Astaires?